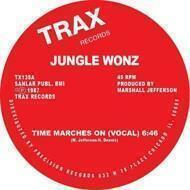 The second Jungle Wonz release on Trax, again with Harry Dennis' gorgeous vocals, was sub-licensed to both New York label Vendetta and Breakout in the UK (both subsidiaries of A&M), with some fine remixes by former Area resident Justin Strauss. "This was one of the first house songs I ever heard when I was like 14" recalls Felix Da Housecat. "Marshall Jefferson has been a huge influence on all my basslines. People usually think that basslines come from 80's pop bands but they came from Marshall Jefferson. Marshall Jefferson is probably the best house producer of all time for this period."